RAID is an acronym for Redundant Array of Independent Disks. With RAID enabled on a storage system you can connect two or more drives in the system so that they act like one big fast drive or set them up so that one drive in the system is used to automatically and instantaneously duplicate (or mirror) your data for real-time backup. What do the RAID modes of WD Sentinel mean? 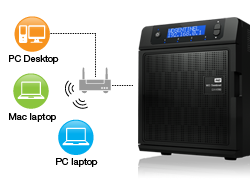 WD Sentinel with three or four drives is automatically set to RAID 5. This gives you the best of both worlds: fast performance by striping data across all drives, and data protection by dedicating a quarter of each drive to fault tolerance leaving three quarters of the system capacity available for data storage. Adding or replacing one of the pre-installed drives is as easy as changing a light bulb. Just open the door and swap out the drives and WD Sentinel does the rest. It seamlessly migrates the server to the appropriate RAID level and automatically expands the server’s storage capacity. 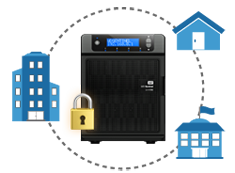 Your users can still access your business data while the drive is being integrated. No data loss. No down time. View realtime updates for drive, RAID and network status through WD Sentinel's Dashboard, which includes easy-to-use task wizards to help you set backup schedules, administer user accounts and manage public and private shares. With dual Gigabit Ethernet connecitivity, WD Sentinel DX4000 delivers read speeds up to 85 MB/s through the Gigabit Ethernet interface. That's three times faster than most network drives in this category today. For maximum flexibility there are also 2 SuperSpeed USB 3.0 ports that allow you to connect additional storage devices and experience up to 5Gb/s transfer rates. With the built-in DLNA media server your employees can access any shared media libraries on the network rather than maintaining copies on their individual computers. You can also stream digital content like videos, music or digital signage for employees, vendors or clients using remote web access. WD Sentinel includes the Connector software for Windows XP, Windows Vista, Windows 7, Mac OS X Leopard and Mac OS Snow Leopard. Support for major network file-system protocols enables cross-platform compatibility and file sharing among Windows, Mac and Unix/Linux operating systems.